Hospital beds have special features for comfort and the well-being of the person using them. They are electric and fully adjustable by remote control. Beds come with an option of half or full length railings. A standard foam mattress is included. 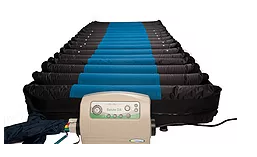 Low air loss mattresses are designed to treat and prevent pressure sores. The salute RDX mattress has 8 comfort settings and comes with a nylon cover. 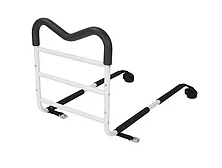 M-Rails are used to assist people in getting in and out of bed. They fit single, double, queen and king sized beds. 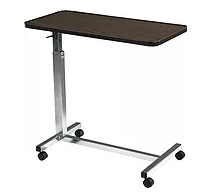 Over bed tables are adjustable in height and comfortably fit over most beds. They reach the height of 45”. Mattress overlays (also known as alternating pressure pads), are used to prevent pressure sores and to provide comfort. The pump has an adjustable dial to set the air circulation to the preferred setting. 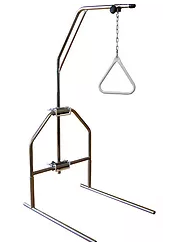 A trapeze is a metal triangle that hangs from a metal frame over a patients bed. The patient can grab onto the triangle to help pull themselves up and position themselves. There are freestanding models as well as models that attach to specific hospital beds.